I love ban chean kueh which overflows with filling. When you eat it fresh from the pan, you need to manoeuvre carefully to avoid the tongue getting burnt and at the same time, make sure the fillings do not flow out into an ugly mess on your clothes and hands. To me, ban chean kueh tastes good only when it is hot, hot, hot from the pan. Once you allowed it to cool down, the outer layer will be rubbery and the fillings not as nice anymore. The edges will be soft and not crispy. So, I must eat the ban chean kueh on the spot and not as takeaway. This couple’s ban chean kueh stall is at the Taman Free School flats at Jalan Terengganu. The stall opens at night. 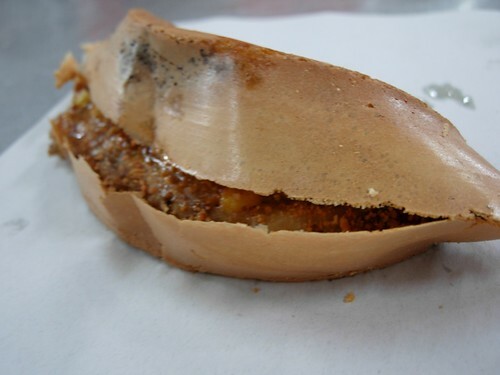 One of the popular order is the crispy ban chean kueh. The man will use the scrapper and scrapped off all the batter, leaving only a thin layer of crispy crusts. Someone bought 10 pieces of this crispy ban chean kueh and other people have to wait a long time for the man to slowly scrapped off the layers. 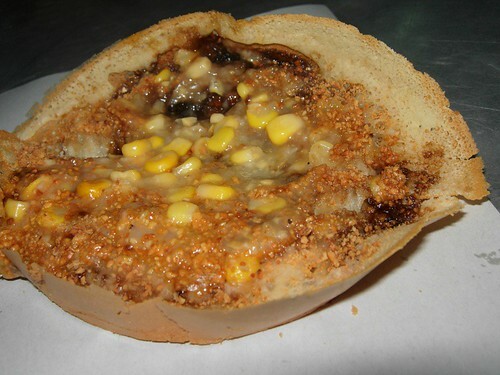 As for me, I love brown sugar, peanuts and cream corn as fillings, done the normal style. 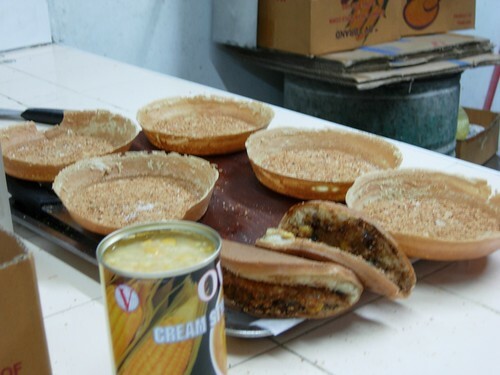 Crispy edges with soft inner parts with overflowing, hot, burning sweet brown sugar and saltish peanuts and cream corn. The price of the ban chean kueh I bought is RM1.10 and I think it is cheaper than the one in Supertanker call Aki Pancake. However, this Taman Free School stall has no frills, only egg, corn, brown sugar as additions without all the cheese and hams like Aki’s. Sometimes I like to eat the thick type – the one that’s made in a big round pan and then cut into pieces. Reminds me of the time then this kueh was only made this way and not in individual small pans. It was always available when there’s a Chinese wayang stage show. Nowadays, I find those made by Malay hawkers especially at pasar malam to be equally good.I also like those sold besides Sunshine Square (Bayan Baru) near a bank.Good ones at Pulau Tikus market too! Another good one used to be near the General Post Office in Downing Street. Not sure whether it’s still there. I think this Taman Free School one is extra crispy because they scrap off the extra batter, which I don’t think is practised by other hawkers. Just wonder, what is he going to do with it, isn’t it a waste to throw it away? yes, I love This free School Ban Chean kueh. I used to work at Jln.Munshi Abdullah and would always q up to buy them. I have now moved to Perth for 5 years and how i am dying to have some more. If you could Share the recepi would b brilliant, though it won,t turn out the same as i have no pan! This uncle is Aki’s father. Caya tark ? kSin – Yes meh? I thot Aki damn rich man son lah. He rides a big bike and graduated from overseas worr….Long time ago, when he was a young man, he said he sell ban chean kueh shiok-shiok oni. That time he was in Taman Sri Nibong. april – I am not sure where to find the recipe but I know they use ‘chow fun’ whatever that is. It is some ammonia powder to make that distinct smell. Doubt we can get the same quality lah. Domino – That one with the extra telur? Aiyor, last time when I was working in Weld Quay, I had that for tea very often. But now, the stall is still there but the quality not the same, not sure same person selling or not. 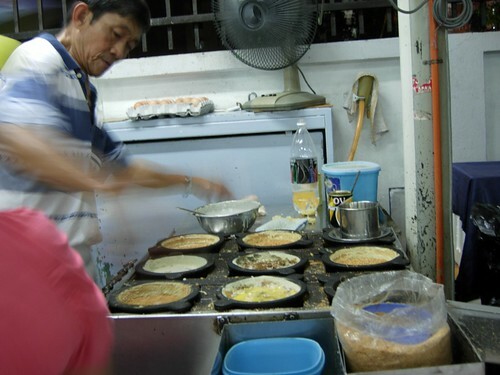 Momo – They scrapped off the batter and throw to the side lor. They charge the customer the same price mah, so waste they don’t care liao. I sayang to pay for the same price but get air only, I prefer the thicker one, baru can full stomach hor? Yeap. I grew up with Taman Free School ban chean kueh and when Aki got married, I got to witness his big bikes entourage. There were no benz. Even the bride went on the big bike. Would you be surprise yet again if I am to tell you that Aki’s wife used to be a nurse by profession? Not in some GP clinic but in a reputable hospital. Guess being your own boss beats working as an employee anytime eh. Now i sounds like a ban chean kueh stalker. LoL. The BCK uncle would know my family as the chit liap nui kongsi noh teh family. Since u hv migrated forget abt our Penang food and BCK until u come back. Otherwise, gian chia loh. Instead take the Aussie BCK called Pizza to satisfy the gian. Autocity-3 in Juru has an outlet called ICE ICE BABY. It has the best pizza i hv tasted. To tell u the truth i hated pizza because of the shrieking tomato taste – sueen ka baysi. But this ICE BABY is fantastic, so are the roasted chicken. Maybe there is an outlet at Perth. Aki’s Hawaiian BCK is excellent; being his most expensive menu. When he was at Taman Sri Nibong, he had a few workers with him. Now only his wife left. The flyover has disturb the livelihood of the makan biz people there. I used to take Kuey Teow Thng there, very famous then. So, it is not true that an transport infrastructure will be a catalyst for growth. See how the go-stan flyover in front of Lam Hwa Ee caused havoc to the hawkers’ centre across the road when it first opened to traffic. Aki told me his tattoo on one-hand costed RM3K… now count how many BCK he needed to sell? His wife’s hand also tattooed. That means RM6K. He rides a superbike. Money is no problem…hahaha. u should try ICE ICE BABY unless u hv already done it. Hello to everybody, I’m tfs guy who like to go round to the other side of the flats, basket ball court and find out that there is a couple who sell very nice apam balik (ban cheah kueh) in front of 12th floor flat very nice. Operating thier stall in the evening. Acek and Aee, are they still selling. Here in kl tak sedaplah thier ban cheah kueh, tin and crispy, jagung little only stingylah. hmm the ban chang kiuh @ perak road. outside the coffee shop with famous loh mee! that was pretty awesome too!! The TFS BCK seller used to sell in front of chap ji chan Block M many years ago. I loved the brown sugar version and used to buy from him often as my family was then staying in Block M. I now stay at Batu Maung and I get my BCK fix at the food court at Bayan Baru market. Lan si uncle selling but his BCK is just great.